Purple is my favourite colour. When I got this lovely bunch of purple basil, whom else would I turn to for the recipe for Pesto, but Jamie Oliver. I have quite a few of his cookbooks, but I referred this recipe here online. I’ve always found Jamie Oliver’s recipes straightforward and easy to make, and if you follow his advice, the resulting dish has to be ‘delish’! The original recipe uses green basil leaves, and I substituted them with purple for the Purple Basil Pesto. I used a nice Parmesan from my hoarded goodies, extra virgin olive oil and pine nuts which my daughter had got for me the last time she came to India. I’m always happy when I have all the exact ingredients listed in a recipe, rather than having to substitute something not readily available here. And Bangalore is the new Eden, where you can get anything: there is this amazing direct farm supply from First Agro Farms that have recently started delivering fresh greens and herbs to my doorstep, and that’s how I got this purple basil for a purple Basil Pesto in the first place. I do hope they are here to stay, and not disappear one day like the online veggie supplier who was delivering veggies and lovely fresh greens and herbs for more than 2 years, but which, sadly, closed shop a couple of months ago. I loved the colour of the fresh purple basil leaves. Rather disappointingly, the Purple Basil Pesto turned more green than purple as I processed the purple leaves in the food processor. The taste was absolutely amazing, though! Jamie Oliver advises that the best flavours of the basil and garlic and parmesan and olive oil and all the rest are brought out by pounding the ingredients using a mortar and pestle. I do have a lovely large mortar and pestle, wooden, beautifully carved and which I bought in a market in Zambia during one of my visits there. But making pesto in a wooden mortar didn’t appeal to me- most of the oil would have gone into the wood instead of into my pesto. So I’ve used a food processor for this recipe. I need to invest in a good stone mortar and pestle. The methodology given below for the Purple Basil Pesto is from Jamie Oliver’s recipe though I’ve modified the quantities of Ingredients. When you measure out the ingredients, you may want to factor in a little extra for tasting. Jamie advises tasting the pesto at each step. With 2 loosely packed cups of basil, the pesto had come down to a small bowlful, and my periodic tasting made quite a bit of depletion in the volumes! It was totally yum! As I have said in the notes below some recipes for pesto advise not adding the cheese to the pesto if you are going to freeze it and not use it immediately, but to add the cheese later on when ready to use. 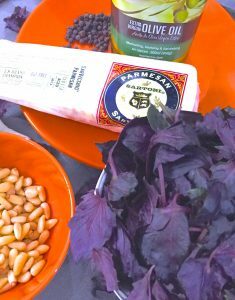 I have not tried freezing my homemade purple Basil Pesto as it gets used up pretty fast, and I don’t make large quantities anyway, so I’m not too sure whether the cheese should be added or not, in case the pesto is to be frozen. The next time I make sufficiently large quantities to freeze the pesto, I will check and tell you whether it is better to freeze it before adding the cheese. 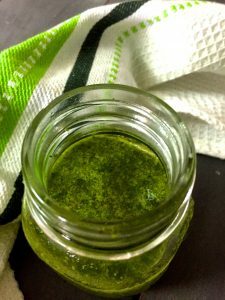 Have you tried my recipe for Basil oil? 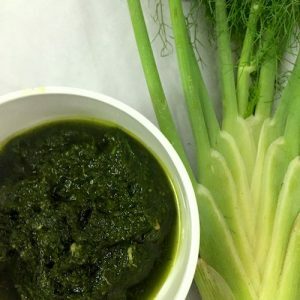 Or for Fennel Frond Pesto? Do check the links below.